Long before the the Internet and Dropbox, there were personalcomputers on local area networks (LANs) and dedicated file servers. 25years ago, Apple introduced AppleShare, the software that could turn aMacintosh into a dedicated file server on an AppleTalk network usingthe network ports built into every Mac. The first commercial LAN was ARCnet(Attached Resource Computer network), developed by DatapointCorporation in San Antonio, Texas, and put into service by ChaseManhattan Bank in New York in late 1997. "It used a token-ringarchitecture, supported data rates of 2.5 Mbps, and connected up to 255computers." At about the same time, Robert Metcalfe was developing Ethernet atXerox PARC. The goal was to allow hundreds of computers to share laserprinters, which were a very new and very expensive technology. Metcalfeconceived Ethernet in 1973 and says that"ethernet was actually invented very gradually over a period of severalyears". Early Ethernet networks allowed up to 255 devices. The goal of networking is to share resources, whether that's anInternet connection, a printer, or files stored on a remote computer.The first widely deployed PC network was Novell Netware, whichsupported a wide range of networking hardware and used a personalcomputer (rather than a mainframe or minicomputer) as a server. Netwarecame to market in 1983, and IBM embraced it in 1984, which helpedestablish it as the leading network operating system of the earlypersonal computing era. When it was introduced in 1984, the Macintosh was revolutionary inmany ways, one being its built-in support for local area networkingusing Apple's AppleTalk protocols andits LocalTalkhardware. LocalTalk used the Mac's RS-422 printer port andsupported a data rate of 230.4 Kbps. The biggest breakthrough in making AppleTalk networking affordablecame in 1987 when Farallon released its PhoneNet connectors,which used inexpensive unshielded telephone cables and standard RJ11telephone jacks, not only making networking more affordable, but alsomaking it easy to create long runs of cable - up to 3,000'! (That'sthree times the 1,000' maximum distance for LocalTalk.) LocalTalksupports up to 32 devices, which made it great for home and smalloffice use. Personal File Sharing became part of the Mac OS when System 7 wasintroduced in May 1991. Prior to that, there had been a few third-partyapps that gave System 6 users limited personal file sharing,perhaps the most used being PublicFolder release by Claris, Apple's software division. Dan Bashur (Apple, Tech, andGaming): My. how far things have come during the last 25 years!Although AppleShare and LocalTalk began to lay the ground for things tocome in terms of short distance file sharing, I can say with muchgratitude how I appreciate what the last 10-12 years have done for uswith Gigabit Ethernet and AirPort wireless networks by increasing thebandwidth exponentially. This is obviously a far cry from using phonelines to transmit data at 230.4 Kbps, as it was in the humblebeginnings of file sharing (but at that time, this data rate was anincredible feat in itself). Technology will always evolve, and as thedata transmission rate and bandwidth continue to increase, it willcontinue to unlock more and more possibilities. It's not a far fetchedidea to think that one day you will only need one central computer withyour files and applications, while every other device you own willsimply access them and utilize them in the "Cloud" regardless ofprocessing demands and requirements, running seamlessly over the airdue to the speed data will eventually travel. I'm not so keen on thethought, as I like to have control of my data and like physicalbackups, but Cloud computing is here to stay. Reflecting on the proposed future, the present, and past, I cansummarize by saying that today's speeds and connectivity options over anetwork are wonderful and seemingly limitless, offering a wide array ofpossibilities, but without the groundwork that was laid built that intothose early Macs (namely the Mac Plus and 512K), none of today'spossibilities or potential for the future would be a reality. Theoperating system should be equally credited with the hardware andconnective options, as they all worked hand in hand. The AppleTalkprotocol was built into System 5 - and unbelievably continued all theway through Mac OS X 10.5.8 Leopard! You could still see those old Macson a modern network, courtesy of AppleTalk continuing to be built intoMac OS X. Sadly, Snow Leopard left AppleTalk behind (I'm guessing thechange to x86 only code vs. PPC/Universal Binary had something to dowith that), but those early Macs and the software designed for themwill never be forgotten. Thanks a bunch, AppleShare (and AppleTalk), for all the fondmemories. I'll never forget how dad's LC, Performa, Power Mac 6100, and Beige Power Mac G3 were alllinked together at one point. They would never have gotten along sowell without you! Leaman Crews (Plays Well withOthers): I think that AppleTalk's greatest legacy was itssimplicity, especially in its original LocalTalk implementation. From ahardware perspective, you couldn't beat the aforementioned simplicityof just hooking up a network via connecting two or more Macs via theserial ports. The ports were built-in, the cables were cheap and easy -and they got significantly more inexpensive once PhoneNet hit thescene. In true Macintosh fashion, this was the network for the rest ofus. Anyone could become a network admin with a two-minute lesson. But the hardware wouldn't have mattered if the software wasn'tequally as simple and elegant. Speaking of "true Macintosh fashion",AppleShare made it brain-dead simple to connect to shared folders onthe network. Just go to the Chooser, click on the AppleShare icon, andinstantly view the AppleShare servers on the network. Click on the oneyou want, then the login box pops up; from here you can log on as aguest (if enabled on the server) or enter your username and passwordfor the server. Then you are presented with a list of shared folders("volumes") available to your login credentials; pick the ones youwant, and then they appear on your Desktop. So simple, so easy, so powerful. The elegance was miles ahead ofNetBIOS on the Wintel platform, which required a true network admin toset up a Workgroup File Service Host Record or Domain Master Browser(a.k.a. a Primary Domain Controller) or just simply a Domain Controllerfor your domain, if you weren't a part of a simple Workgroup. NovellNetware may have been easier from an end-user perspective, but itsurely required more than a two-minute lesson to set up. 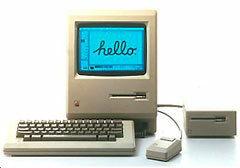 With the switch to OS X, Apple started to phase out AppleTalk withdelicate care. In the beginning, OS X used AppleTalk only for browsingthe network and would only connect to printers using AppleTalkdirectly. File servers needed to be able to do AppleShare over TCP/IPfor OS X clients to actually connect. (I remember adding ShareWay IP toa few older machines that didn't have the capability built-in, to allowOS X to connect). Over time, the far more modern and efficient Rendezvous - officiallyZeroConf, and later renamed Bonjour - replaced AppleTalk as thebrowser. Bonjour also assigns familiar Internet-like DNS names tomachines on the network, so that today all of the Macs (and even Linuxmachines) on my network have simple Bonjour names (like mini.local orubuntu.local) to allow for quick and easy AFP (the AppleShare protocol)connections. Once again, Apple has kept it simple and easy whilekeeping up with the latest in technology. That quick two-minute lessonstill applies to networking any number of Macs. Charles Moore (several columns): I can't really speak tothe pioneering days of AppleTalk and AppleShare, because my experiencewith using these technologies back in the day was minimal. I rememberwhat a revelation it was when I discovered that I could transfer filesfrom my Mac Plus to my LC 520 viaa printer cable without benefit of floppy or Zip disks as a medium. Another anecdote was how impressed a PC (DOS in those days) orientedrelative of mine, who has a post-graduate degree in softwareengineering, was when he discovered that the Mac came with built-innetworking, which he deemed a huge advantage - which of course itwas. Later on, we wired up an ethernet LAN in the house, which is stillthere, although pretty much dormant in the era of Dropbox, although Istill occasionally do data transfers between Macs via direct ethernetcable hookups, especially since I've been using a MacBook with noFireWire support. My next job was at a local publishing house, where we had a littleover a dozen Macs networked with PhoneNet. We had four book designers,each with a Macintosh IIciequipped with 8 MB of memory, a 40-100 MB hard drive, and Apple's Two-Page Monochrome Display. We had two cover artistswho had larger hard drives, 12 MB of memory, and 20" color monitors. Inthe editorial department, we had a mixture of LCs andLC IIs connected to Mac Portrait Displays. Therewere two LaserWriters on the network, one in design and one ineditorial. We had one 44 MB SyQuest drivewith several disk cartridges that we used for daily networked backupusing Retrospectand for supplying files too big for a floppy disk to the printer. Thiswas the era of System 7.5, Word 5.1a,and Quark XPress3.2 - and we designers were remarkably productive with those 25 MHzMacs. That network started getting flaky as we expanded past 20-25 Macs,and somewhere around there we moved to ethernet for 40x fasternetworking (about the same difference in speed as between USB 1.1 and2.0). By the time I left in 2001, we had over 80 Macs on the network,used a high capacity tape drive for backup, and had just entered the G4era. 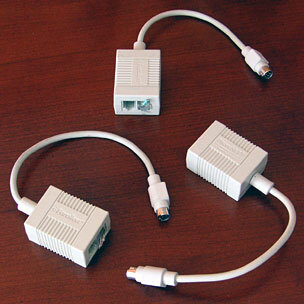 Through it all, AppleTalk made networking easy, and ethernet madeit quick. Kudos to Apple for making networking plug-and-play way backin the mid-1980s! Allison Payne (The BudgetMac): I've never had the opportunity to use LocalTalk or AppleTalk,but I harbor nerdy fantasies about someday connecting all of my vintageMacs into a big circle of file-sharing awesomeness. And I can't imagine my computing life without Dropbox, so I'meternally grateful for the seeds Apple and others planted that have ledto so much networking innovation over the last three decades. Dan Bashur:One more thing to add to this discussionis a link to Adam Rosen's article Vintage Mac Networking andFile Exchange. Last night, Austin Leeds and I were discussing thisvery subject of getting an old Mac on an AppleShare local network overEthernet that lacks an Ethernet connection or the possibility to addone. Adam's article clearly explains how this can be accomplished witha "middle" Mac you put in-between them that has both an Ethernet and aserial connection so that you can still link them. Adam states that aQuadra is usually a good choice for a "middle" Mac, and if both targetmachines can boot into OS 9, I would tend to say that a Lombard orWallStreet would also be a great choice.